gluten issues? lactose intolerance? egg allergy? coeliac? we deal with diabetes and peanut allergy in this house – not quite the same but I understand the difficulties! Wheat and egg intolerance. Violent puking. That said, peanuts are pesky little buggers. Aren’t they technically not a nut? technically they’re legumes – but regardless of technical status, they are indeed pesky little buggers! lucky enough to have participated in desensitizing research trial at addenbrookes – so now life is a bit easier. but i don’t envy you with the wheat and eggs – they’re EVERYWHERE !!! 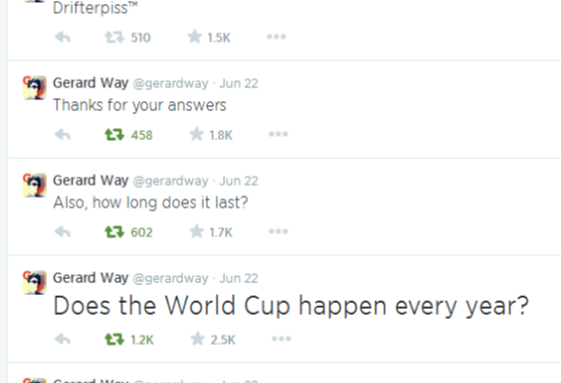 what made me laugh about Gerard’s tweets is that he could’ve found out the answers to his questions with a quick google search. Twitter has become his go-to place, seems he can’t survive without the interaction. such an attention whore!! Then had a good laugh watching some of the other comic relief clips. i love how they get so many celebs to do stuff. Daniel Craig!! making ham sandwiches in a little terrace house, Daddies sauce and newky brown. and the lovely Mr Tennant! I think Gerard is slowly turning into everyone’s favourite uncle, it’s brilliant! i think your dad was probably safe – wrong gender! but hey, it’s still a claim to fame. admittedly not one you want to tell too many people. Uncle Gerard !!! hahahahaha. gotta be said his attire is slipping into uncle/granddad territory at times – checked shirts and comfy jumpers, instead of tight leathers and tees! but it is kinda fun, his daily twitterfest – compulsive viewing. even persuaded me to make pancakes at the weekend!! I saw them on Twitter! Every weekend I think “I have got to master pancakes.” Thing is, 2/3 normal pancake ingredients make me violently ill so I’ve got to get to grips with hippie ones.